Al Gore’s The Assault On Reason is largely an extended critique of the Bush administration?s policies. But, in suggesting in his introduction that Chapters 1 through 5 of The Assualt On Reason, the first half of his book, would be about the “enemies of reason,” Gore suggests a theory of the media, of history, and of reason that identifies Jurgen Habermas’ characterization of “the refeudalization of the public sphere” as a trend of the present era of politics (18). So for this book review I will consider both Gore’s (2007) book and Habermas’s (1962, originally) book as analyses of media history. Here I will concentrate upon the similarities of Gore’s template to Habermas’s. Introduction: Al Gore’s The Assault On Reason is mostly about the Bush administration. But it’s also about, as its title suggests, “reason.” The first five chapters designate supposed “threats to reason,” such as fear, dogmatism, the conquest of the “public sphere” by the wealthy, the spread of lies, and government violations of individual rights. 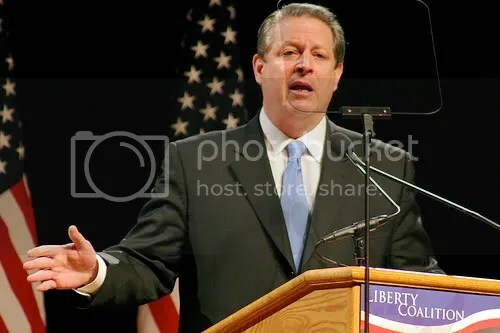 The concentration of all of these “threats to reason” in the Bush administration, Gore argues, leads to three negative outcomes: America is less secure, abrupt climate change threatens the globe’s ecosystems, and American democracy is threatened. Behind Gore’s critique of Bush, then, is a history of communication media. The introduction even contains a sustained critique of the theories of Marshall McLuhan, who was (in North America in the 1960s, at least) the world’s most famous media historian and who had a theory of “cool” and of “hot” media (20). In this history, the print media promoted a “public sphere” in an earlier era, television is a harmful enabler to Bush in the current era, and the Internet has the potential to bring back democracy to America. The theory of the media that would seem to most thoroughly inform Gore’s notion of an “assault on reason” (and thus his critique of Bush) is that given by Jurgen Habermas in his early (1962) book Structural Transformation of the Public Sphere, whence Gore’s citation of the “refeudalization of the public sphere” on p. 18 of The Assault on Reason. Gore’s Habermasian idealism goes all the way down to his interest in the notion of the “unforced force of the better argument” (or at least in a “meritocracy of ideas” of some sort) that one sees in Habermas’ later works on argumentation. But, generally, Gore sees his work as a contribution to the “public sphere” that is mentioned in the abovecited early Habermas work. In order to see Gore?s adoption of Habermas’ (1962) historical template, I will discuss Structural Transformation of the Public Sphere and then situate the argument of The Assault on Reason within its premises. Habermas: Habermas’s Structural Transformation of the Public Sphere can be argued in a nutshell: The historical appearance of the “public sphere” has a distant echo in Classical Athens, to be sure, but its modern appearance comes with the separation of the “public” and the “private” in the early eras of capitalism, most specifically in the 18th and 19th centuries. The “traffic in commodities and news” (17), which expands at the beginning of the capitalist era in the 16th and 17th centuries, later becomes a “public sphere” with the proliferation of newspapers, leaflets, and other forms of literary culture. The main distinction of the “public sphere,” and of the “civil society” which participated in it, was that it was a forum in which “civil society” could criticize the state. The actual places where this criticism were performed were the literary salons of early modernity and, essentially, the Victorian coffeehouse, where “public opinion” could be voiced. Now, this historical “public sphere’ was marked by gender and class exclusions — this is why Habermas calls it the “bourgeois public sphere,” and it’s why historians like Mary P. Ryan note in Habermas and the Public Sphere that “women were patently excluded from the bourgeois public sphere, that ideal historical type that Habermas traced to the eighteenth century, and were even read out of the fiction of the public by virtue of their ideological consignment to a separate realm called the private.” But within the clubs, the coffeehouses, the salons, matters of status were disregarded (36). Generally, however, the bourgeoisie were the “public” which constituted “civil society,” with the working class peering in from the outside. 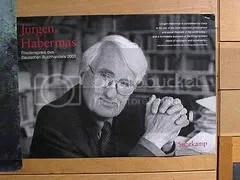 Habermas goes into detail about the developments in literary life that reflected the development of the public sphere. Now, one can see Bush from Habermas’s (1962) perspective as someone trying to use the tools of media manipulation to make the Presidency into a complete autocracy. In Habermas’s (1962) sense, Bush is completing a trend that was there as a potential since the first days of universal access to radio or television. Bush, then, can easily be seen as the ultimate consequence of what Herman and Chomsky call “manufacturing consent.” The general insinuation of this type of history is that the public sphere was useful for the triumph of the bourgeoisie in their struggle with the old aristocracies of Europe but, once its rights had spread to the rest of the public, it became absorbed in the “consumer” dispensation described above by Habermas. So let’s see, then, what Al Gore makes of the template of the (bourgeois) public sphere. African Americans, Native Americans, and women were not included in the circle of respect two centuries ago, of course. And in reality, access to the public forum was much more freely available to educated elites than to the average person. Even though literacy rates were high in the late eighteenth century, illiteracy was a barrier for many then, as it is for many Americans still. I would ask Al Gore to consider that “capitalism” and “economic freedom” mean different things to people of different social classes. To the poorest among us, “capitalism” means the obligation to pay, and “economic freedom” means having enough money to pay, or at least to be able to make a living without being trapped in debt peonage. To the wealthiest among us, the “incestuous coupling of wealth and power” IS “economic freedom.” “Capitalism,” then, is not equivalent to “economic freedom” for everybody. This entry was posted on Friday, October 12th, 2007 at 6:14 am and is filed under Uncategorized. You can follow any responses to this entry through the RSS 2.0 feed. Responses are currently closed, but you can trackback from your own site.